For the best beaches in Japan you have to go to Okinawa prefecture. This subtropical region in the East China Sea has warm, crystal clear seawaters and great white beaches to offer. We made a list of the top 5 most perfect bounty beaches in Okinawa that are worth a visit. Speculated by the Japanse and international tourist advisor agencies such as TripAdvisor this is supposed to be the best beach in Japan. We support this suggestion in every way since Yonaha Maehama beach is all you expect from a tropical beach. The sand is white, the water is turquoise blue and warm, the temperature is great and we ask ourselves what clouds are, because there are none. The Yonaha Maehama beach is located on Miyako Island. 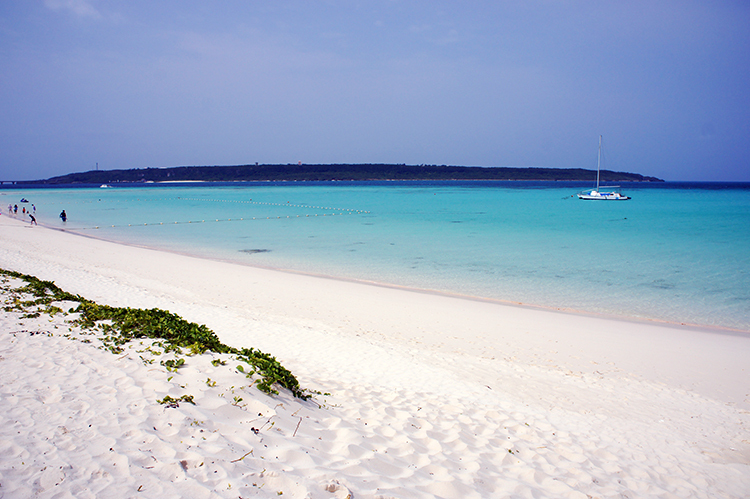 When you are into snorkeling or diving Nishihama beach is probably the best place to go in the Okinawa region. This beach has beautiful shallow coral reefs that can be seen by snorkel or scuba diving. The water is super clear and makes it feel like you are in a huge swimming pool. The Nishihama beach is located on Hateruma Island. We like this beach since it is a huge sandbank in the middle of the Sea. The island has no trees or vegetation growing on it only a 7 km-long beach with crystal clear water surrounding it. The Hate no Hama beach is located near Kume Island and can be reacted by tour boats from the main island. The beach is located on Tokashiki Island, which is a national park since 2014. The Aharen Beach has fine white sand and crystal clear waters where you can find lots of sea life while snorkeling. You can reach this island easily from the capital Naha by high-speed boat. The Island is beautiful and please respect it and keep the island clean of rubbish! Staying on Okinawa Island than Okuma beach is the place you want to go for sunbathing. The long stretch of sand offers sunbathers all they want. You can stay here in one of many resorts and enjoy life, as it should be on a holiday. The hotels offer various excursions to meet the marine life.